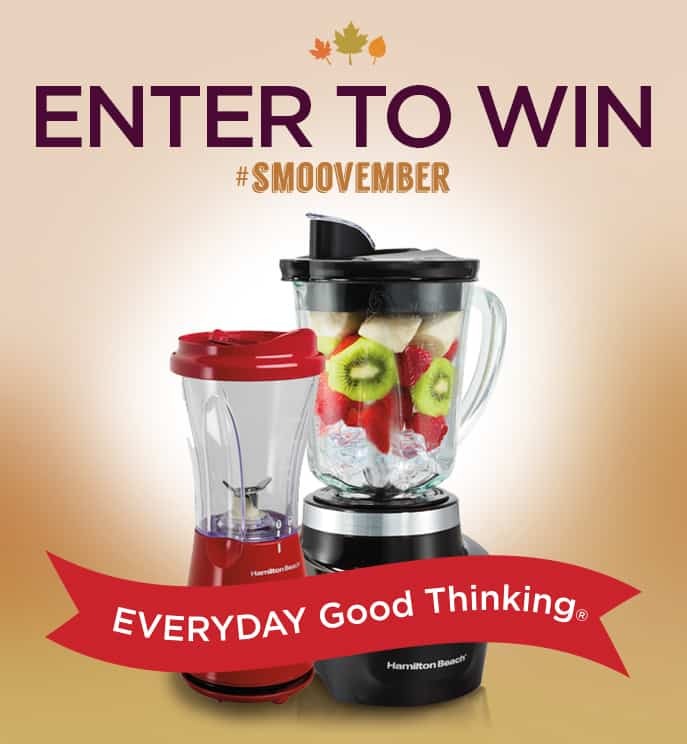 This month I am celebrating #smoovember with Hamilton Beach! Chilly autumn mornings are tough. I can’t roll out of my warm, comfy bed. And even after I’m dressed and ready for the day, I’m still a slow and a bit brain dead. Breakfast usually solves that. I made these two very different smoothies that have been known to brighten and perk up even my most dreadful Monday mornings. Oh, yes. Espresso, peanut butter, banana, milk, AND CHOCOLATE! I’m all about indulgences (in moderation, of course). Instead of my usual latte, this Hyper Monkey puts a happy bounce in my step, it makes me smile from ear to ear, and it has enough caffeine to keep me sane for hours. Okay, it may not be the most nutritious breakfast drink out there, but it sure it delicious! And it is a breeze to make in my new Smoothie Smart blender. The recipe makes enough for two and is meant to be shared. Pour milk and espresso into blender jar. 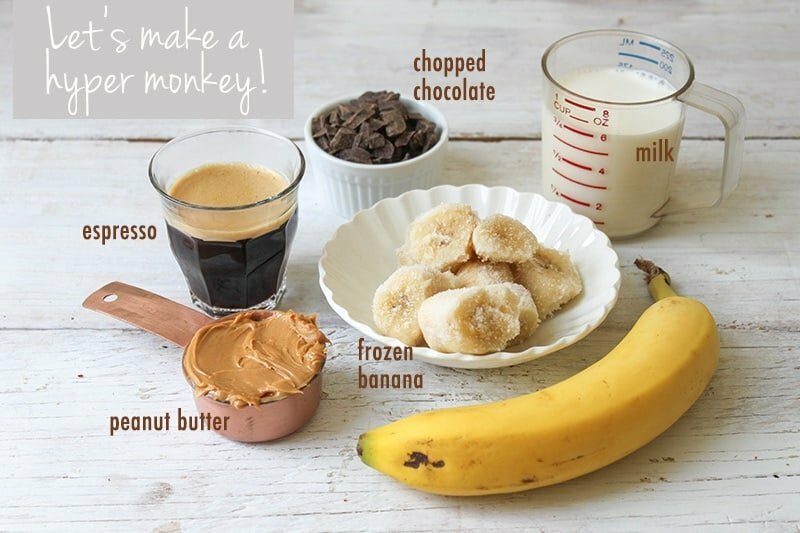 Add frozen banana and peanut butter. Add about a half a cup of ice. Cover with lid and press auto smoothie button. Taste smoothie and add agave syrup as needed to sweeten. Add additional ice if thicker consistency is desired. Add chopped dark chocolate and pulse for a couple seconds until chocolate bits are distributed (and added ice is blended). 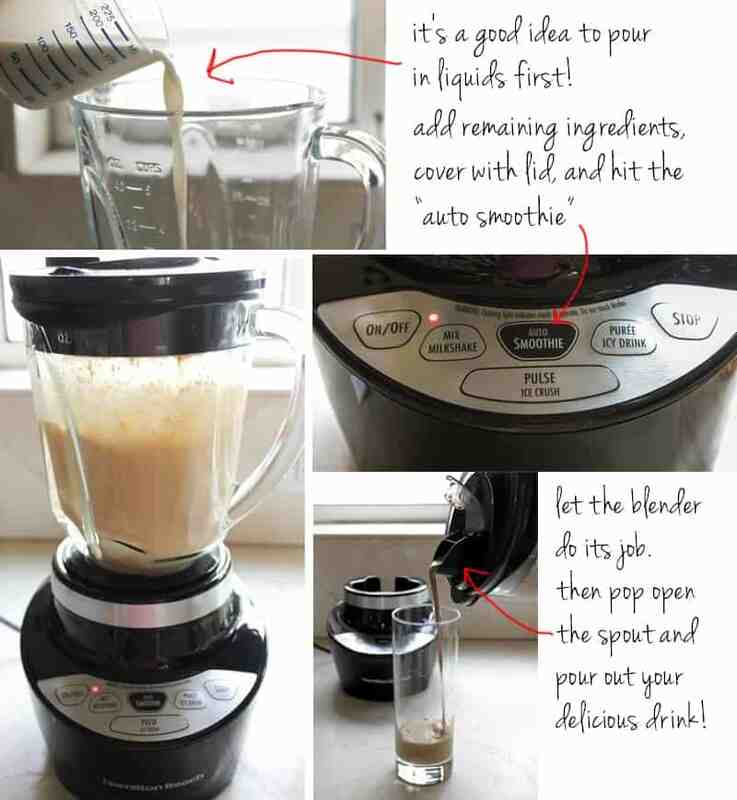 Remove blender from machine, open spout and pour into 2 glasses. Serve immediately. Garnish with a banana slice and additional chocolate chunks. If my Hyper Monkey is a little too much for you, maybe you’ll like his healthy veggie-fruit smoothie! Juicing was all the craze this summer. Everyone, their mothers, and their grandmothers were juicing. Unfortunately, I don’t have a juicer. But no worries, my Smoothie Smart blender does the job! This Happy Green Monster truly does make me happy. I feel so refreshed, alive, and rejuvenated after a glass of this good green stuff. 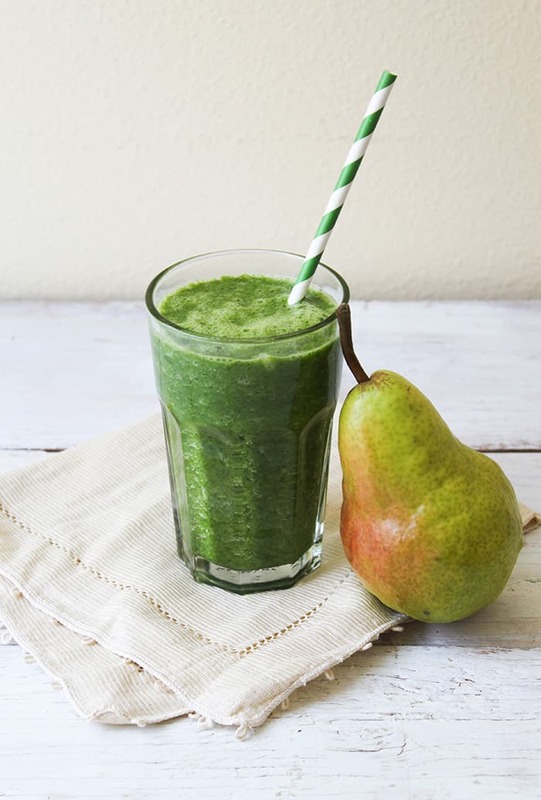 This green smoothie is packed with all sorts of good stuff- vitamins and nutrients from the raw kale and spinach, antioxidants and anti-inflammatory benefits from the pear, and the coconut water to help hydrate you. This is one drink you don’t have to feel guilty about, and its a great way to increase your veggie intake. 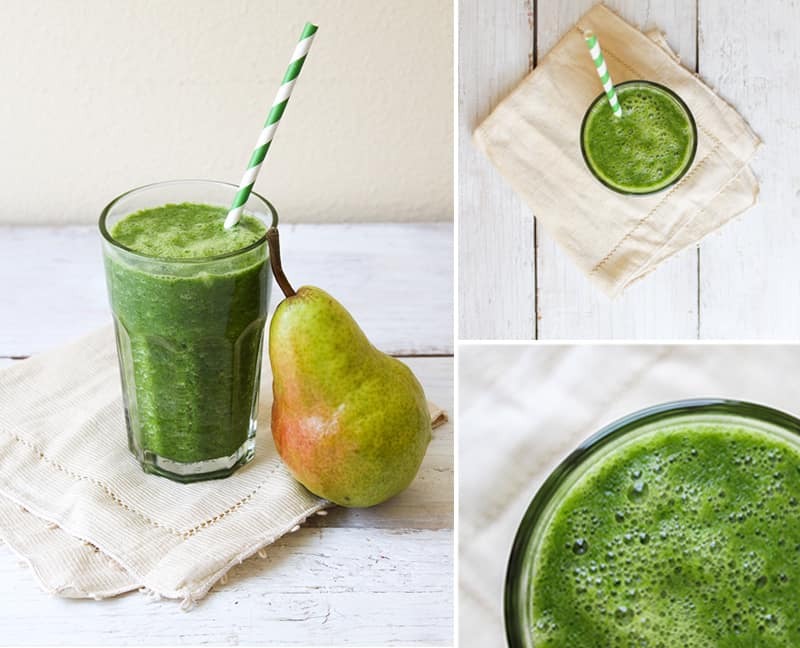 Asides from breakfast, these two smoothies are great afternoon pick-me-ups! I was really surprised by the power and strength of this Smoothie Smart blender. With smoothies, juices, and blended beverages so popular these days, I think its a good idea to have a solid blender. Instead of going out to buy your drinks, experiment at home and make your own concoctions! If you happen to try out my recipes or make your own, be sure to snap a photo of it and share it with the hashtag #smoovember! Pour coconut water, coconut milk, and agave syrup into blender jar. Squeeze in juice of half a lime. Add pear, spinach and kale. Cover blender with lid and hit auto smoothie button. Remove blender jar from machine and open spout. Pour into 2 glasses. Serve immediately. Otherwise, place in refrigerator for up to 24 hours. Now it’s your chance to win your own Hamilton Beach Smoothie Smart Blender! To enter the giveaway: Leave a comment with your favorite blended beverage. Comments are moderated and may not show up right away. One comment per person, please. Giveaway only open to U.S. residents, 18 years of age or older at time of entry. Winner must be willing to provide a valid shipping address (no P.O. Box) in order to receive prize. Comments close at 11:59 PM (PST) on Monday, November 18. The winner will be chosen at random and notified Wednesday morning. 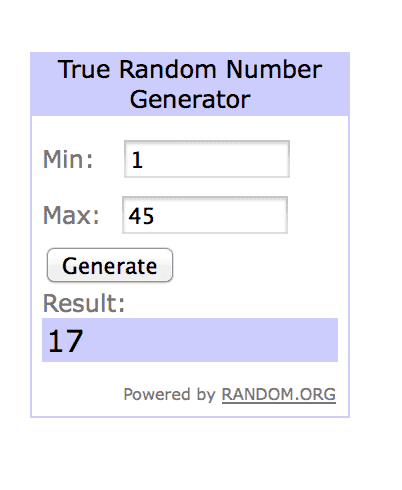 If the winner does not respond within 48 hours, winner forfeits prize and another winner will be chosen at random. Be sure to leave a valid email address, or I won’t be able to contact you if you win. Once the winner has been chosen, The Little Epicurean will then notify Hamilton Beach, and Hamilton Beach will mail you your smoothie blender set! Disclosure: Hamilton Beach is providing the Smart Smoothie Blender and Single Serving Blender set for this giveaway. I received the same blenders for review. All opinions are my own. My favorite blended beverage includes blueberries, ice, Greek yogurt, peanut butter and bananas. It is very delicious. My favorite smoothie has agave, Greek yogurt, and strawberries. It’s addicting. This summer, the combination of grilled peach, almond milk, greek yogurt and a dash of honey was on repeat! 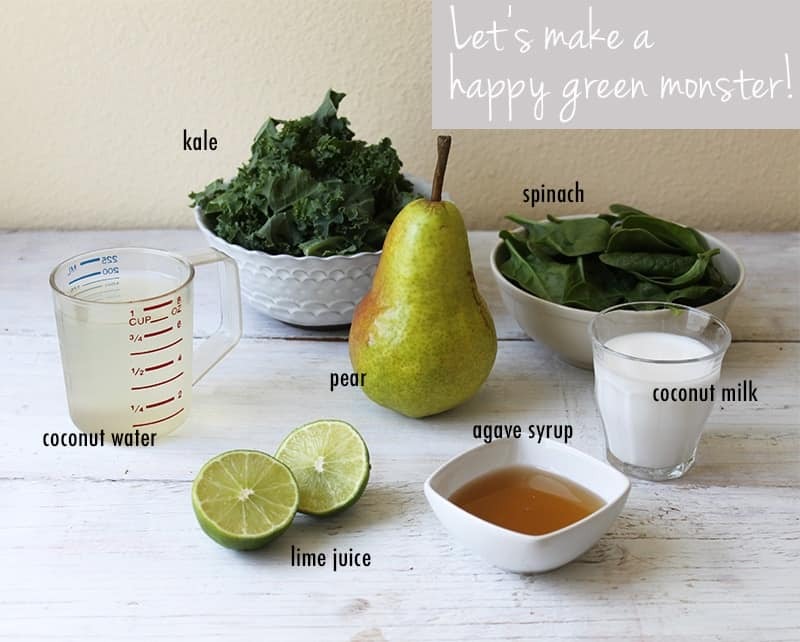 The happy green monster sounds awesome! My favorite thing to add to any smoothie is a frozen banana. Makes everything rich and creamy. Favorite smoothie: Pineapple, kiwi, lemon, apple, and carrots! My favorite is a PB&J smoothie I used to get all the time in NC. Blueberries and peanut butter! My daily smoothie of orange juice, ice, banana, strawberries, blueberries, and a handful of spinach is my favorite blended drink. My favorite blended smoothie includes almond milk, almond butter, raspberries, bananas, protein powder and honey. From the beverages you posted in this blog I would prefer the green one for sure. 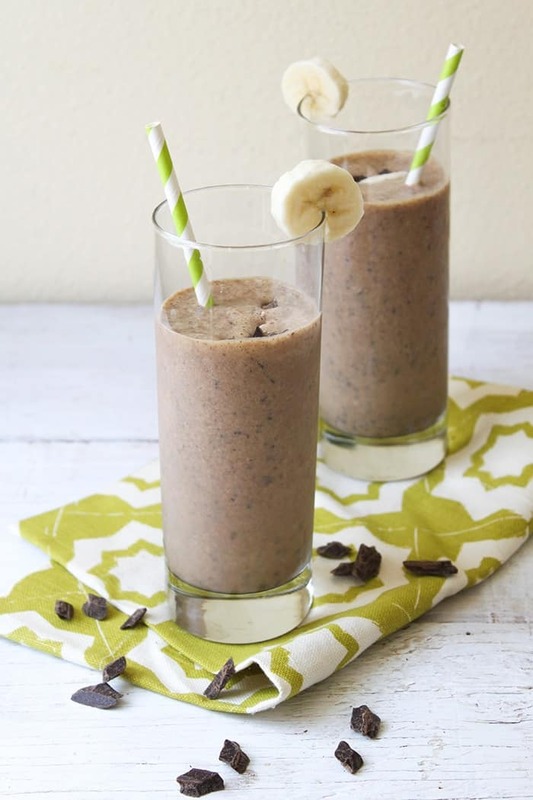 YUM Coffee almond banana smoothies! My favorite blended beverage is frozen strawberries and blueberries with non fat yogurt, honey and mint. A wonderful afternoon snack! Current favorite smoothie: kale, banana, almond milk, ice, and honey. Even my super picky 7 year old loves it! I like frozen coffee drinks. my favorite is a blend of spinach, blueberries, frozen banana, and almond milk! 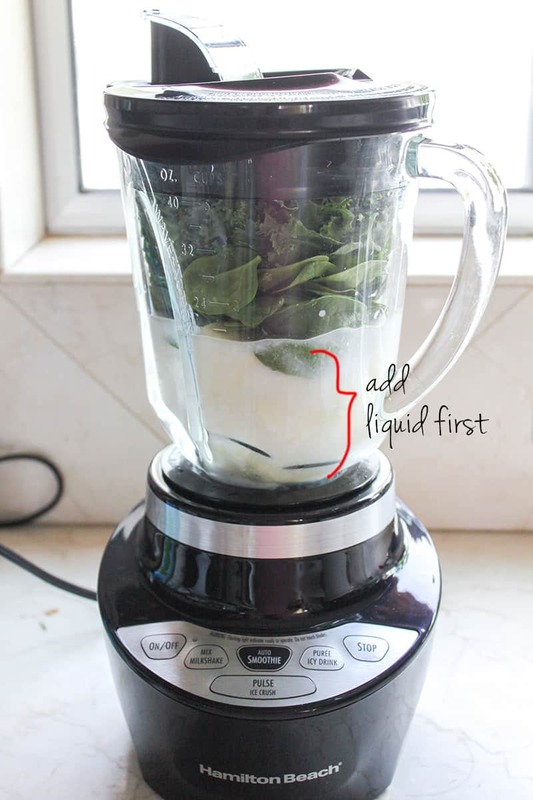 I love smoothies and always have to add greens no matter what! My favorite is a blend of apple juice, yogurt, banana, peanut butter, and chocolate. Yum! My favorite blended beverage – I have this every morning – apple juice, a banana, juice of 1/2 lime, an orange, turmeric, cayenne pepper, ground flax seed, frozen strawberries, frozen blueberries, and gingeroot. I work from home and therefore make smoothies almost daily. I usually just whip up whatever goodies I have in my fridge/freezer. Today I made a smoothie with fresh squeezed orange juice, raw sliced ginger, kale, swiss chard, sliced apples, half a squeezed lemon, organic frozen raspberries, and oats–super smoothie! I love a blend of banana, chocolate protein powder, lots of spinach and ice with either water or almond milk… So yum! I love spinach, coconut water and pineapple, it tastes like pina colada! Favorite oatmeal, nutella, banana, milk, yum! I like mine with cocoa powder and bananas…feels like I’m being super naughty when I’m not! I like to throw in protein powder to up the healthy factor! My favorite smoothie has banana, orange juice and vanilla yogurt. Liked on facebook. I love my spinach, pomegranate, pear, red grapes and flax seed! My fave daily breakfast smoothie consists of spinach, frozen blueberries, banana, almond milk, splash of apple juice, and honey! My favorite is milk, yogurt, banana and blueberries/stawberries. A nice, powerful, and protein packed supplement after a workout! Ive gotten into green smoothies! Avocado with cucumber and unsweetened almond milk! Almond milk, avocado, raspberries, Greek yogurt, spinach and a bit of honey. My favorite blended (adult) beverage is a margarita. But since I can’t drink those daily, I like blending an orange with water, stevia, ice, and vanilla extract. It’s a nice treat and a great way to drink more water. I just got back from my honeymoon in Japan and now I think my favorite blended drink must include matcha! Your posts ate amazing! I want a green smoothie! My favorite blended beverage is a frappuccino! Thank you for your entries! And thanks for sharing all your favorite blended drinks. I can’t wait to try some of them out! My favorite beverage is still the beginners luck smoothie. It has all of my favorite flavors and fruits, so great I stumbled upon it! Thank you for the great ideas you bring to my table. Hi! The Happy Green Monster Smoothie sounds great, but I am wondering what type of coconut milk you mean? I assume it’s the milk beverage substitute (similar to soy or almond milk), but I also stock canned culinary coconut milk in my cupboard for cooking, and figure that could be good too? Thanks! I use canned coconut milk. I like it because it’s richer in texture and flavor. However, the lighter coconut milk (sold in cartons and similar to almond milk/soy milk) works, too.